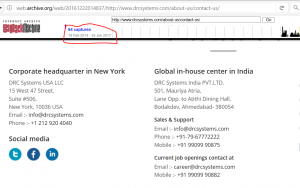 Criminal Complaint against DRC Systems India Pvt. Ltd.
Today we make a criminal complaint against DRC Systems India PVT.LTD. The public prosecutor’s office should check whether there is a criminal offense from DRC Systems India PVT.LTD. We had already made a criminal complaint against the headquarter in New York, but the manager said DRC Systems USA LLC. is only affilate partner, the fact to this you find here. Why we do this? We made a payment for an extension, but DRC Systems said, after payment, that they can not development the extension for this money. So the money should be refunded. But until today, we get no money back. Because we made a criminal complaint. The full story about Rating and Review about DRC Systems from India and DRC Systems USA LLC our readers found here. So you know which risk are possible if you decide to use Offshore software development. So customers should be careful with orders in other countries, where others rights are there. On 11th May 2017 we send a letter to DRC Systems India PVT.LTD.. It was an registered letter with return receipt. It was very impressive, how long this letter need to the offshore Software development in Ahmedabad India. 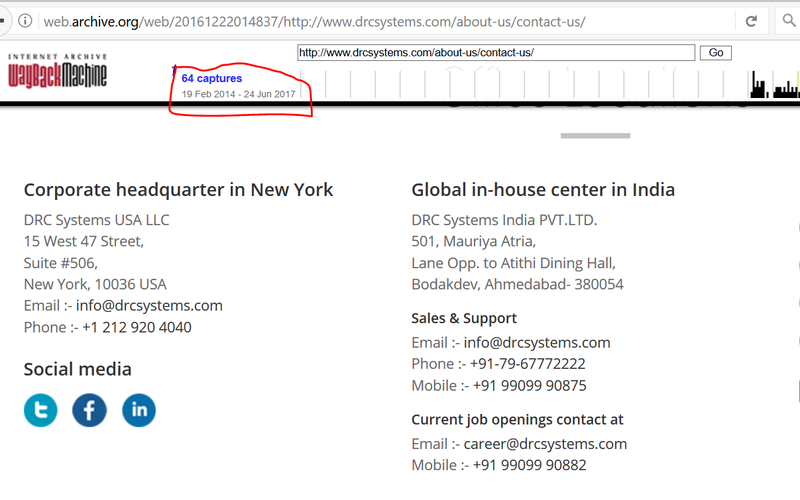 24th May 2017 Delivery to DRC Systems in Ahmedabad = 13 days ! 04th July 2017 Delivery in Germany = 31 days ! The letter to the software development programming contains a payment request. But as we know DRC Systems from India, there was no solution. 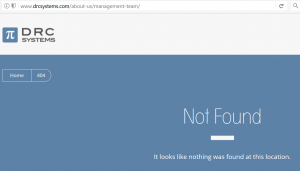 Management does not react and does not pay! The whole story on this website. Statement of DRC Systems USA LLC. to the criminal complaint. Our readers know, we made a criminal complaint against DRC Systems USA LLC in New York, to check the operation. Today we get from the „Office of the New York State Attorney General“ by email the statement of DRC Systems USA LLC. The Manager of DRC Systems USA LLC. is Mr. Mahesh Sutariya. 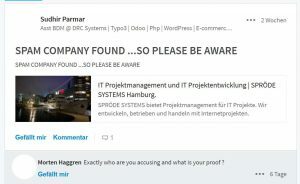 „… DRC Systems USA LLC and DRC Systems India Pvt. Ltd. are separate entity and has no direct or legal relation. DRC Systems USA LLC is an affiliate partner of DRC Systems India Pvt. Ltd. I would agree with Mr. Börge about doing payment to our bank account but that is in agreement with DRC Systems India Pvt. Ltd. because his payment was failed to their bank account. We have paid this payment further to DRC Systems India Pvt. Ltd. which is actual receiving party. In October 2012 Mr. Sutariya with Mr. Hiten Barchha (technical manager DRC SYSTEMS) come to us to Hamburg.Mr. Barchha introduced us Mr. Sutariya as member of the management of DRC SYSTEMS. Mr. Barchha spoke as was Mr. Sutariya his boss. After this visit, Mr. Sutariya send us an email with date of 22nd October 2012. „… First of all tanks you very much for your me and hospitality during our visit in hamburg…“ after that he is talking about the project. In the Footer DRC SYSTEMS, Phone in India and USA, E-Mail from DRC SYSTEMS. 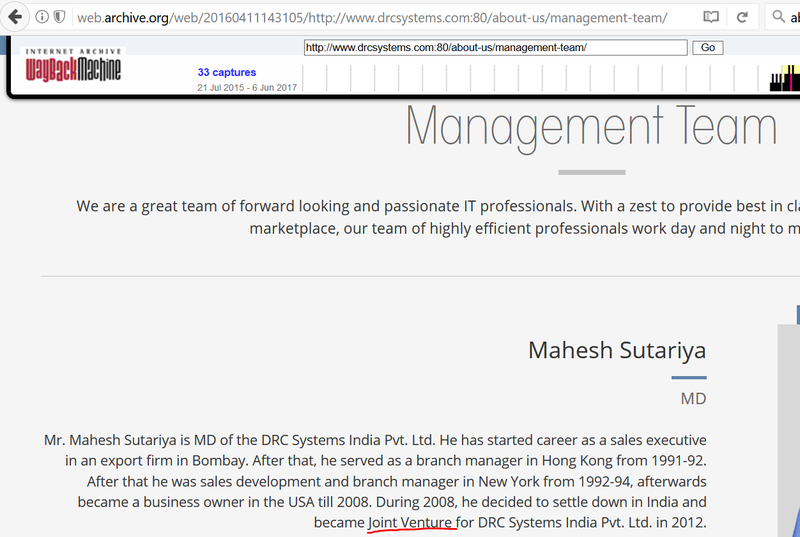 Normaly we see under this website http://www.drcsystems.com/about-us/management-team/ the management team of DRC SYSTEMS: Mr. Mahesh Sutariya, Mr. Kirit Gajera and Mr. Hiten Barchha. But about this link you can see the version of 06th June 2017. We think, these facts speak for themselves! Review of DRC Systems USA LLC! If us users now we work with DRC Systems from India from Ahmedabad in India and we send money to DRC Systems USA LLC. Our Review is not very good about this experience about DRC Systems in both location. Review DRC Systems from India and DRC Systems USA LLC. After the review / our experience with the company, we decide to make a Criminal complaint against DRC Systems USA LLC.? With date of 02nd June 2017 the New York State Office of the Attorney General confirm me, that they want to check the case. The Office of Attorney General send my complaint to DRC Systems USA LLC. Now DRC Systems USA LLC has to comment this complaint. We are curious, as the statement will be. DRC Systems USA LLC Criminal Complaint, Suspicion of embezzlement? 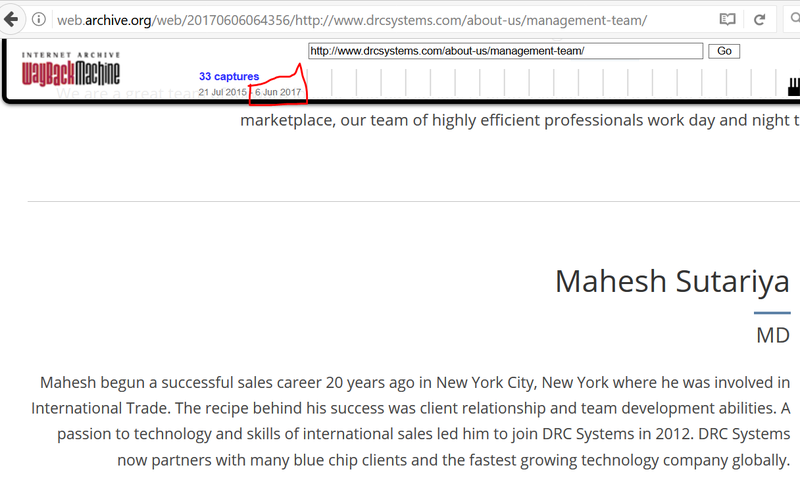 Criminal complaint against DRC Systems USA LLC ? 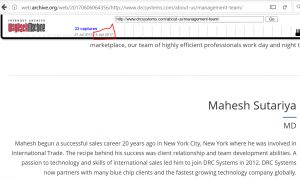 For a while DRC Systems make us an offer for a website extension. We send the money, but later DRC Systems from India said, that they can not do that for such amount. So the company want to refund the money. We wait and wait for the refund, but DRC Systems USA LLC and DRC Systems from India do not pay our money back. Criminal complaint against DRC Systems USA LLC. Now we decide to create a criminal complaint against DRC Systems USA LLC. The public prosecution will now checked the suspicion of embezzlement. We will see what the test results. 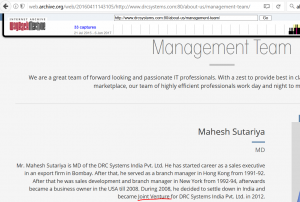 We contact the management of DRC Systems – Mr. Mahesh Sutariya, Mr. Kirit Gajera and Mr. Hiten Barchha – but nothing helps! They take our money, delivery no product and not refund the money. 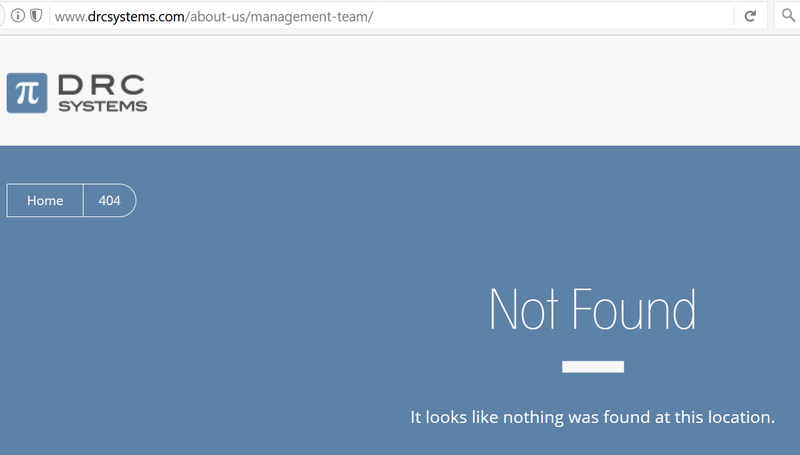 The management is no great help in this case. We send several reminders, but they refund not the money. We wait now on the response of the public prosecution. That example shows that offshore development had a high risk and customers can lost all of his money with thus companies.